Body Conditioning is a fitness program for dogs of all ages and activity levels. 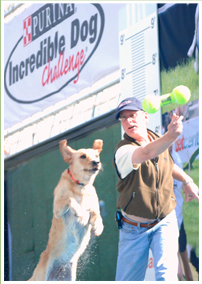 It is a fitness program that builds strength and endurance, and improves balance and flexibility in your dog. To keep your dog healthy over the course of its lifetime, minimize injury and improve joint longevity, it is important to further develop in these areas. That is done by expanding its exercise plan beyond what it is currently doing and by applying specific cross training techniques individualized to meet your dog’s needs. Cross Training improves core and trunk strength for increased performance and is key in injury prevention. It will also improve other supporting muscle groups with exercises to target specific body areas. 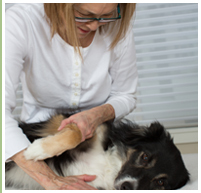 Our mission is to help you to improve and build on your dog’s muscular/skeletal health and keep them strong and flexible throughout their lifetime. 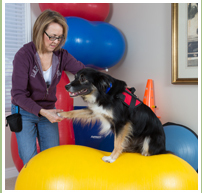 We strive for optimal results in fitness, mobility and comfort according to your dog’s ability and needs, and your goals. In order to achieve that long term, it helps to engage the owner by teaching you the exercises so you can maintain at home. The exercises are great fun for the dog and also help to keep them exercised or entertained on rainy or cold days. The equipment and methods used for strength training forces your dog’s body to utilize deep and middle layer stabilizer muscles, normally not targeted during other daily activities. Stability balls, balance discs, balance boards, wobble boards, balance cushions and balance pads are all tools used to aid in strength and balance training; and allow you to target specific muscle groups. Builds trust and bond between you and your dog.